Gamle Aker Kirke is the only medieval church in town, not counting the royal chapel at Akershus festning. The exterior was restored by architects Schirmer and von Hanno in 1861. Earlier images from prior to 1861 show the tower shaped quite differently. It survived the many fires of Oslo, because it was not in Oslo. It only came within city limits in 1859. 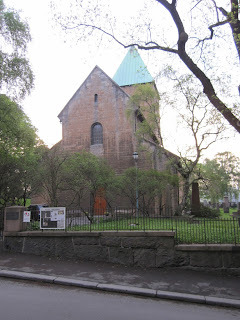 As far as I have understood, the church is fairly representative for medieval churches in Oslo. Most of them were built in the 11th and 12the century, and were for the most part pre-gothic. The royal church dedicated to the virgin mother was in brick, not stone, and was at least partially gothic, but the rest of the churches were generally older. 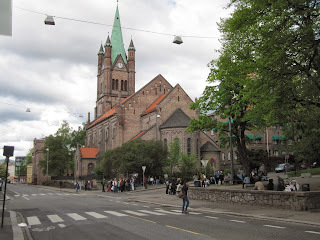 In its heyday, Oslo had nine churches, excluding the one above. But after countless fires and plagues, there was only the cathedral left when the old city was finally abandoned in 1624. 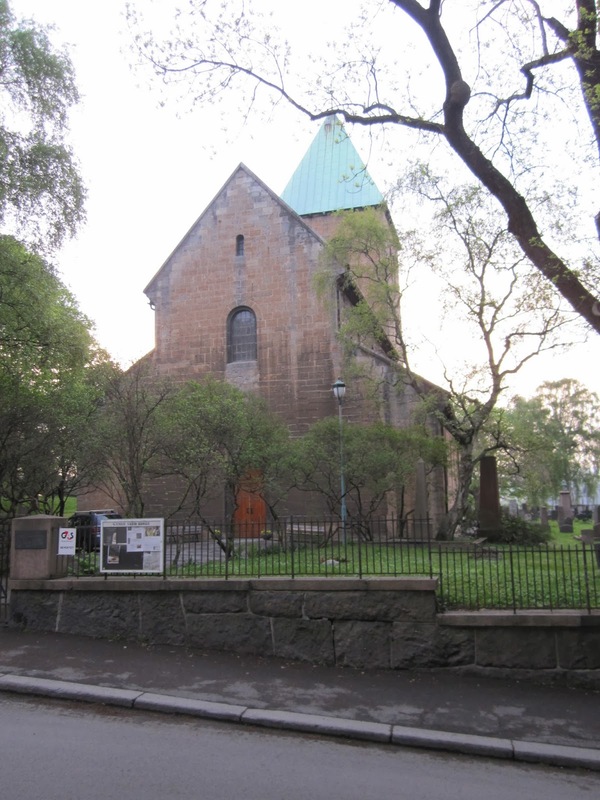 The second oldest church in Oslo is from 1796. You could argue that the cathedral is older, since it was originally built in 1697. However, the cathedral was given a completely new look in 1849-50, and doesn't look at all like an 18th century church. In fact, Oslo Kirke looks somewhat similar to what the cathedral used to look like: the tower crowned with a simple pyramid-shape. They are both brick churches, though Old Town is plastered and the cathedral was/is not. The earliest church on this site was built by the Franciscans in 1290 as part of the cloister that was located here. The church was one of the first in Norway to be built in brick. It was converted to a hospital in 1536 and destroyed during a Swedish attack on Oslo in 1567. A new hospital was built in 1581 and the first floor of this building was used a church. A new church was built in 1734, at a time when Oslo was no longer the main urban settlement in the area. However, Oslo retained a small and fairly prosperous community with its own congregation. This church was destroyed in a fire in 1794. Building of the new church was completed two years later. Alterations were made in the 19th century but the church was restored to original in 1934-39. The cathedral (Vår frelsers kirke) was originally built as the second church of Christiania. The first one was built in 1632-39, but was demolished already in 1686. A great fire had started when lightning hit the spire, but the decision to raze the church was primarily on military grounds (defences of the city were reoriented towards the fortress and, the church happened to be situated too close). As part of the reorientation, the outer bulwarks around the city were removed, and in one of the earliest sections to be removed, a site was found for the new church. It was built in 1694-97, and much of the yellow brick from the old church was probably reused, originally imported from Leyden in the Netherlands. In 1774-75, the facade was plastered and painted white. The church as it looks today, however, is pretty much the work of the German architect Alexis de Chateauneuf. He was originally invited to offer assistance and advice for the rebuilding of the church, but soon offered his own plans, which were adopted in works carried out in 1848-50. The tower was extended, in red brick in contrast to the old yellow, and capped with a new spire. The spire may have been inspired by Kronborg Castle, which de Chateauneuf would have seen on his way from Hamburg. A new gothic portal was added and the vault in the nave were decorated in gothic ribs. The latter was removed during restoration work in 1933-1951. The new chapel to the south, by Arnstein Arneberg, was also added during that period. The 1840s was a turning point for Norwegian architecture and ushered in a lot of German ideas. Both Linstow and Grosch had recently visited the country and took with them ideas inspired by Schinkel and others about medieval styles and non-plastered brick facades. Heinrich Schirmer also settled in Norway, and supervised the construction work in 1848-50. It was decided around the time that de Chateauneuf visited the city that a second church needed to be built. The municipality wanted to give the assignment to the German architect, but to be fair to local architects and master masons, a competition was arranged. This was probably the first of its kind in Norway. Tullinløkka was one of the first sites to be considered, as this was state-owned property, but it was decided to find a place with a higher terrain. Hammersborg had already been considered as a suitable spot for the various institutions needed for the young state, a Norwegian Acropolis. A wooden church, Christchurch, had also been built in the 17th century as a temporary solution for the new town of Christiania (demolished in the previous century). The municipality bought the property called Sorgenfri in 1849. This included the top of the hill, but for some reason a site further down was chosen. Maybe because the more prominent location included the main house of Sorgenfri while at the lower part there were just some barns that needed to removed. The municipality used the main house as a hospital, and the site was considered twice for a new city hall, in both cases competitions were arranged and winners picked, but nothing was ever built.The plan was also for the church, named Trefoldighetskirken, to lie on the axis of Theatre street, but the owners of the plots were unaware of this or didn't care, so new buildings were built that shifted the angle of the street by the time the church was finished. De Chateauneuf also suggested to completely rebuild Hammersborg. However, the municipality doesn't seem to have ever seriously considered this option. The church has a dome, apparently inspired by the baptistery in Pisa. The general style is gothic and the size of the towers are reduced to enhance the appearance of the dome. De Chateauneuf developed the plan in 1849-50. He soon left Norway and died in Germany in 1953. Supervision of building work was left to his assistant Wilhelm von Hanno. Due to cost and structural considerations, von Hanno reduced some of the details in de Chateauneufs plan. The church was completed in 1858. By that time, yet another church had been built in the same area. The catholic cathedral, St Olav domkirke, was finished in 1856. There were hardly any catholics in the country at that time, but Queen Josefine was catholic and much of the financing came from her as well as donations from various other sources. The architect was Heinrich Schirmer. Meanwhile, von Hanno and Schirmer had become partners and were among the city's most prominent architects in the 1850s. From having only one church, Christiania now had four, if we also count Old Aker Church, bought by the municipality in 1852 and formally within city limits in 1859. 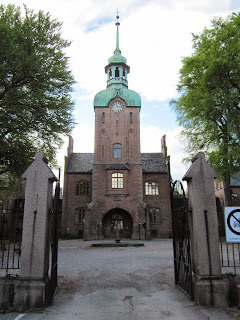 Whereas new churches were built in Christiania, new churches were being built in Aker as well. Prior the 1850s, there was only one church in the whole of Aker, and this was sold to Christiania in 1852. Therefore, replacement churches were built in 1853-55 and in 1857-60. Vestre Aker kirke was built on a property at Ullevål. 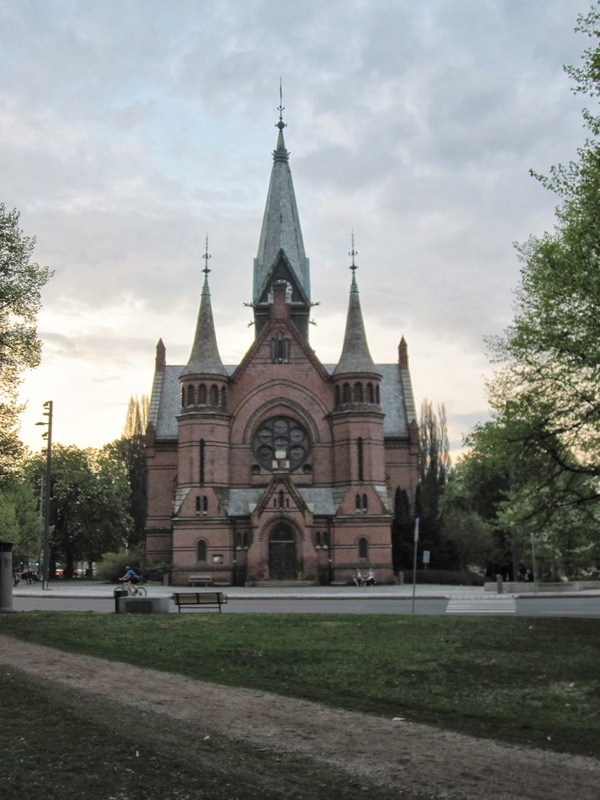 The architect was Heinrich Schirmer and responsible for construction were the master masons Carl, Alfred and Albert Unger, all brothers from Prussia. The combination of German-born architects and masons thus continued. The result is typically German, red-brick gothic.The involvement from Schirmer is a bit unclear when it comes to the second church. It appears that Østre Aker kirke was built by the Unger brothers, according to some designs that Schirmer had developed for the previous church. The second church is located at Ulven. The border between the two congregations went through Torshov and Sinsen and just to the east of Grefsen. Both became Oslo churches when Oslo was expanded to include all of Aker in 1948. Schirmer also built another church in Aker, completed in 1855. This was the church at Gaustad Sykehus. In this case, however, the project was financed by the state and not Aker municipality. This probably meant there was more money. So, the tower was capped with an ornate copper spire, and sandstone was used in the facade as well as brick. The style is usually described as gothic, though there is a clear influence from dutch renaissance. The building is actually an administration building, but it also contains the church. In 1859, the city of Christiania was expanded considerably. All of the area known as Bymarken or 'Byens Grund,' as it was called, became officially part of the city. The city even expanded across the river to what was known as 'Landets Grund,' belonging to Aker. There had been a settlement east of the river called Grønland at least since the 17th century, and Aker wanted to get rid of it because it was poor and put a strain on resources. It belonged to the city, it was argued, because the basis for a settlement in the first place was tied to the economic web of the city. Christiania was reluctant to accept this. At some point, it was considered to give Grønland the status of city in its own right, under the name of Akerstad. However, in the end Christiania relented, and even demanded more land from Aker, as it was realised that both sides of the river up to Sagene would be valuable land for factories. A congregation for Grønland was created in 1861. A competition was arranged for the building of Grønland kirke, won by Wilhelm von Hanno in 1864. The project also included a fire station and a school. The ensemble was completed in 1868-69. The style has been described as romanesque. The boundaries for the new congregation was the river and Trondheimsveien in the west (People in Grünerløkka had to cross the river to Old Aker Church) and Strømsveien in the east. Oslo was part of the same congregation though it already had its own church and the boundary between the two was Munkebekken (also known as Nonneelva, Klosterbekken or Hovindbekken). Three new congregations were created in 1874: Johannes, Jacob and Paulus. 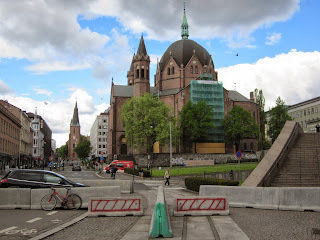 Construction for Johanneskirken started already in 1868, but took ten years to complete due to difficulties with the foundations. The church was designed by Georg Bull, and built in yellow brick. It was built on the same site as the first church in Christiania. The congregation was for the west part of Kvadraturen and Pipervika. Continuing problems with the foundations meant the church had to be closed at the beginning of the 20th century, and was finally demolished in 1928. Bull was also the architect for Jakobskirken. This church is still there, though it was long threatened with demolition. The plot was purchased by the municipality already in 1824 and was used as a graveyard until 1880. The church was built in 1875. 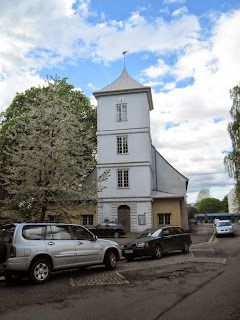 The congregation was for the old communities of Vaterland (including Sagbanken) and Fjerdingen, as well as the still developing, Hausmanskvartalene. Though Bull was the first Norwegian-born in the 19th century to design churches in the capital, there is continuity in style. Bull studied engineering in Hannover and architecture in Berlin. On the other side of the river, a community sprang up from nowhere in the 1850s. After 1859, however, this area was subject to the city's building regulations, and it was no longer allowed to build in wood. The owner of the land, Hans Frederik Grüner, had argued for a long time that it was unrealistic to insist on brick. Eventually, he sold most of the land to Thorvald Meyer and Carl Michelet. Michelet sold his share at the end of the 1860s, as dismal demand seemed to prove Grüner right for most of the first decade. In the 1870s, however, Christiania experienced its first spectacular building boom, and Grünerløkka grew rapidly. Initially the congregation in Grünerløkka was housed in the bethel house Hauges Minde at Olaf Ryes Plass, which was completed in 1874-75. The new church was complete in 1877. The architect was Danish-born Jacob Nordan. The name was changed from Paulus to Petrus in 1892, due to the rapid growth of Grünerløkka and Sofienberg. The name Paulus was switched to a newer church. 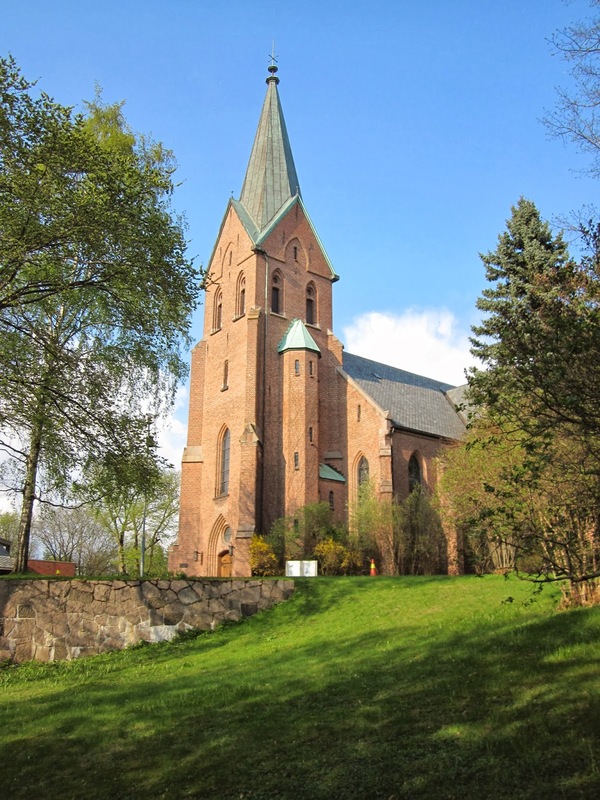 The name changed again in 1962 to Sofienberg kirke. Originally, the new congregation covered the whole area between the river, Fossveien, Sannergata, the city boundaries of 1859 and Trondheimsveien. As a side note, I could also mention that a church was built for Krohgstøtten Hospital in 1859, according to a design by Christian Grosch. It was demolished in the 1950s. City boundaries were expanded again in 1878. The main reason was to stop satellite towns from developing just outside the borders. These were poor areas dependent on the city in terms of employment and commerce. Christiania had always had such communities: Vaterland, Grensen, Vika, Hammersborg etc. It was easier and cheaper to build in wood, so people tended to settle outside the borders to avoid having to build in brick or with timber framing. After 1814, when the city really began to grow, new ones appeared: Enerhaugen, Ruseløkkbakken and Bergfjerdingen. It was thought in 1858 that problem would be dealt with, that the city boundaries were so vast in comparison to the city itself that the distances would discourage any new settlements outside the border. This was obviously a miscalculation. New mini-towns continued to crop up: Kampen, Rodeløkka, Vålerenga. Therefore, a belt area around the 1878 borders also required the use of brick in construction, and this measure actually solved the problem in the end. The second expansion of the boundaries in 20 years meant that the city was still inheriting fully fledged communities, requiring amenities and a church. First out was Kampen kirke. A site was cleared due to a fire and construction began in 1879. The church was designed by Jacob Nordan and was completed in 1882. Overseeing construction were master masons J. Paulsen and F. Johannessen. The congregation was officially created in 1880. It covered an area between Hovinveien, Sørligata, Jens Bjelkes gate, Sverres gate, Åkebergveien and Strømsveien up to the city boundaries. In 1888, the economy slowly started to recover from a long period of stagnation. At the same time, a second generation of Norwegian-born architects began to emerge. It was in this year that Henrik Bull and Christian Fürst won their first competitions in Kristiania (Fürst won the competition for Sagene kirke). Both of them were still residing in Berlin, and they sent in respective proposals from abroad. As such, this was similar to the beginnings of the career of Christian Grosch, who sent in a winning proposal for Christiania stock exchange while still in Copenhagen, back in the 1820s. Bull was also second generation in a more direct sense, as he was Georg Bulls son. The crisis of the 1880s had brought construction at Grünerløkka to a standstill. However, development had been so rapid in the 1870s, and was expected to resume, that it was evident that a new church was needed. 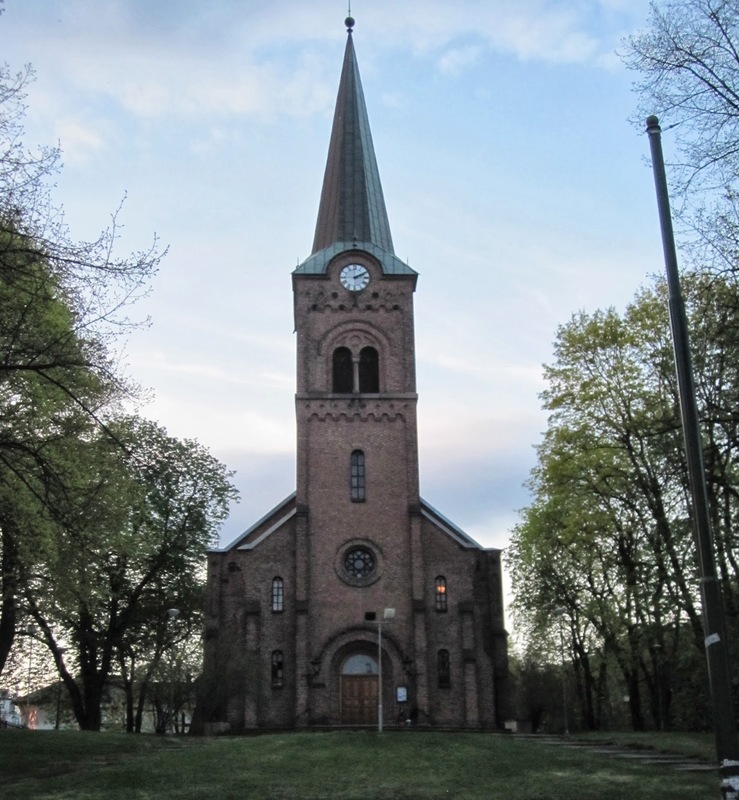 The Old Paulus Church, completed in 1887, was renamed Petrus and the old name transferred to the new church: Paulus kirke. This way, Grünerløkka and Sofienberg each got a church. They would soon need it, as many of the city's new arrivals settled there, In 1886, Grünerløkka had only 13 600 inhabitants. In 1900, there were 22 000. Sofienberg had 7 800 in 1886, but 21 000 in 1900. Several of the most populous streets in the city were in Grünerløkka. Thorvald Meyers gate, Markveien and Toftes gate were three of only five in the entire city, with a population in excess of 3000. The new church was completed in 1892. The boundaries to Petrus was established in 1897, and followed Toftes gate, Helgesens gate, Teglverksgata, Verksgata, and Fagerheimsgata, to Sannergata. Verksgata doesn't actually connect to Fagerheimsgata, but there seems to have been plans for a square to bridge this gap: Christies Plass. There is football field there now, called Dælenenga. The congregation for Sagene was established already in 1880. In fact, Sagene had been a separate community for hundreds of years. As far back as the 1500s, there had been a settlement making a living from the sawmills along the river. When Christian IV established the city of Christiania, Sagene was the suggested alternative for people who could not afford to build in brick. What was known as Sagene back then was much more extensive, and stretched almost as far south as Grünerbrua. At the beginning of the 1800s, there were about as many people in Sagene as in settlements such as Vaterland, Vika and Grensen. Northern and Eastern Sagene was outside Bymarken, but was transferred to Christiania from Aker in 1859. Nonetheless, new settlements in places such as Moløkka, just on the outskirts of the new boundaries were still being built in wood, until the boundaries shifted again in 1878. 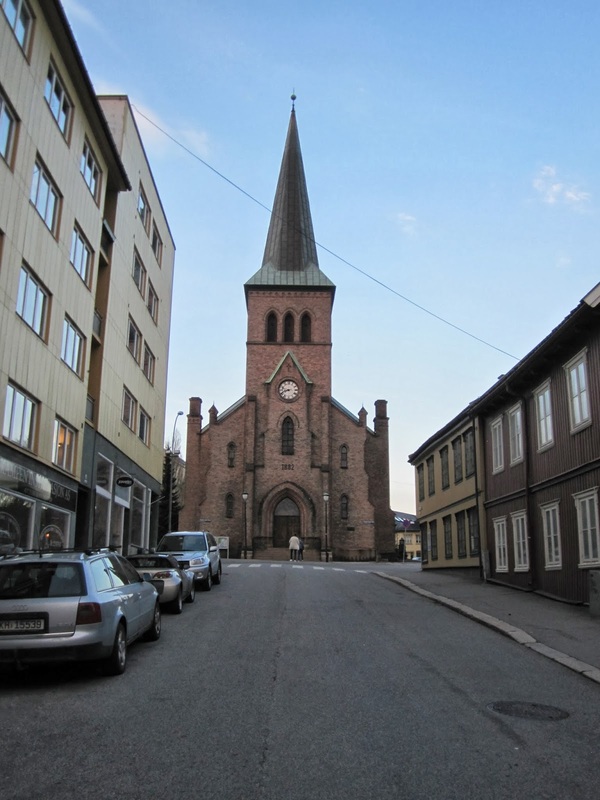 The site selected for Sagene kirke had previously belonged to Dannevigsløkka, outside Bymarken but inside the boundaries established in 1859. The plot and what would later become the park Graabeinsletten, was apparently owned by the municipality for some time, as it was used to store gravel from the 1850s onwards. As mentioned previously, the church was designed by Christian Fürst, who also had designed the new church for Arendal, completed in 1888. A this time, Fürst was an assistant at Paul Wallots office in Berlin, and was possibly involved in some way in the design for the German Reichstag. The altarpiece at Sagene is a copy of the altarpiece from the cathedral of Antwerpen. The next church to be built in Oslo was in Vaterland, in 1899. The architect was Heinrich Jürgensen and the style has been described as Venetian late-gothic. Unlike the predecessors, the facade was plastered with only some of the detailing in exposed brick, and the church was not free-standing but incorporated into a city block. It was a so-called småkirke, an idea created in Britain and adopted in Denmark. The point was to have small congregations, so as to create a closer bond between the church and the working classes. This may also give some insight as to why the municipality was so keen to build new churches in the east, as the dangers of moral degradation were seen as most pressing in those areas. A similar church was built for Tøyen (Halfdan Berle, 1906-07) and in Pipervika (Harald Aars, 1911). Aars also planned a complex with church at the corner of Nordbygata and Lakkegata for the city anniversary in 1924, but nothing came of it. Both Vaterland and Pipervika have been demolished, but Tøyen is still standing. The small churches were also meant as response to the emergence of free and non-municipal churches. Evangelisk lutherske frikirke was built in 1885 by Carl Konopka, and still stands in Lakkegata 47. A catholic church was also built at the back of Urtegata 29 in 1896 by Ole Sverre, demolished in the 1960s. 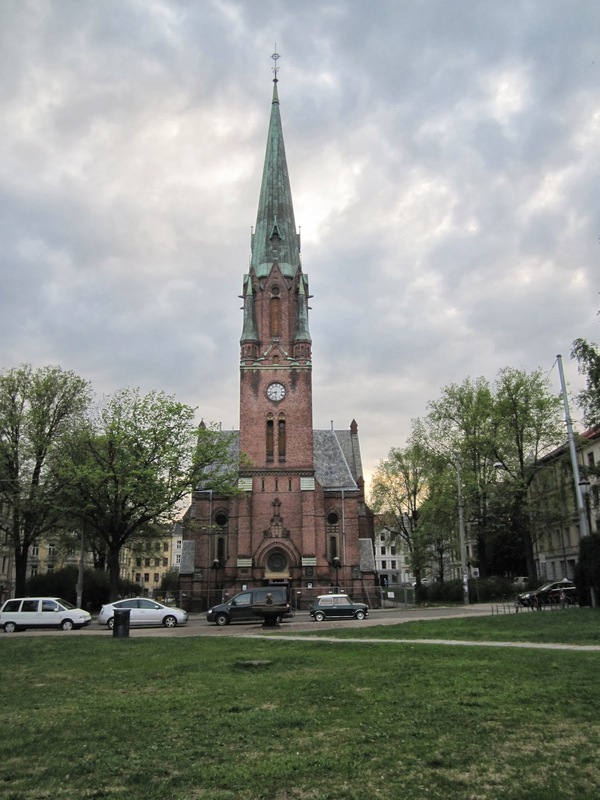 Although churches such as Vaterland and Tøyen were built in brick and plaster, the new movement for the main municipal churches were for the facades to be dressed in stone. The late 1890s was in many ways the apex of German influence in Norwegian architecture but counter-trends emerged simultaneously dedicated to the creation of a more national style. 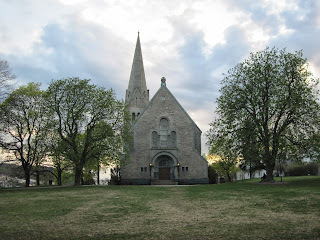 People such as Hermann Schirmer pointed to the fact that Norwegian medieval churches were dressed in stone, and although influenced by English and Scottish traditions had a character of their own. The first church to be built according to the new principles was Vålerenga kirke in 1902. It is dressed in granite with details in soapstone, and has the tower placed asymmetrically. The architects were Heinrich Jürgensen og Holger Sinding-Larsen. The church was damaged by fire in 1979, and re-consecrated in 1984. 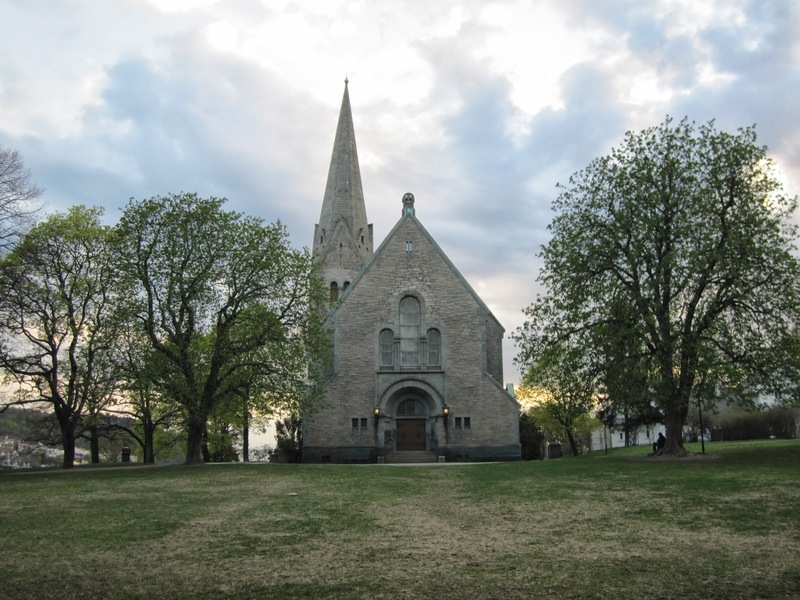 The 1890s was a massive growth spurt for the west, leading to the creation of two new congregations: Fagerborg and Frogner. 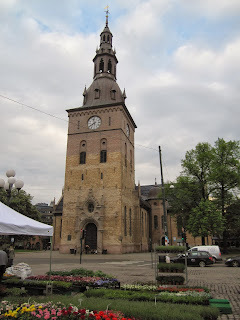 Construction for Fagerborg kirke began in 1901 and was completed in 1903. The architect was Hagbarth Schytte-Berg, who triumphed in a competition among 54 proposals. The church is dressed in granite (details in polished granite), and though the style is clearly medieval, it is usually described as also incorporating elements of jugend. 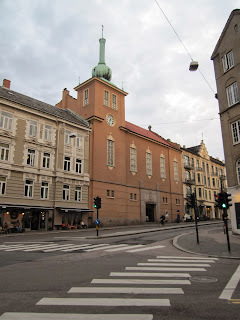 The church is located in Stensparken, at Norabakken. The name Stensparken comes from an estate called Steinn, later Sten. The municipality bought the plot in 1896 from what was then called Reisersens løkke. From 1825 to 1868, it had been used as a rubbish dump and sewage pit, and was probably municipal land during that period. Stensparken was part of Bymarken and was incorporated into the city in 1859. The park was developed from the 1890s to the 1940s. The congregation was officially created in 1897. The borders to Uranienborg, Gamle and Vestre Aker were Bogstadveien, Hegdehaugsveien, Oscars gate, Pilestredet, Thereses gate and Kirkeveien. At the same time, new churches were being built in Aker: Ullern and Grorud. Both were by the architect Harald Bødtker, who had become Akers kommunearkitekt. For Grorud, Bødtker collaborated with Halfdan Berle. 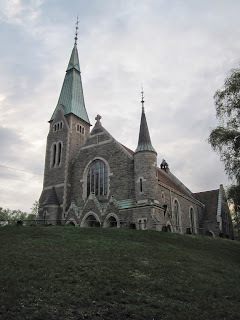 The congregation for Grorud was only created in 1947. Much older churches already existed at Nordstrand (Jacob Nordan, 1886) and Sørkedalen (Christian Grosch, 1865). A plot for the planned Frogner kirke was found in 1894, at Gimlehøyden, on a property known as Jørgenslyst or Gimlehøi. The congregation was created in 1898 and a proposal was chosen in 1902. In the 1890s, the church was probably planned as a free-standing structure. But by 1902, it was already decided that it would be built as part of a city block. This was probably a cost-saving measure, the municipality could get some cash by selling of the remainder of the land to developers, and it was possibly also a political gesture to show that modesty also reigned in the west, especially considering the difficult economic climate after 1899. This way, only the front would be dressed in stone, while the back, hidden behind other buildings, could be in plain brick. 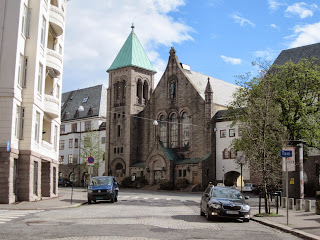 The competition in 1902 was won by Ivar Næss and the church was finally consecrated in 1907. As with Fagerborg, the facade is dressed in granite, with polished detailing. Næss' original plan was for the church to be pulled back from the street, so that the neighbouring buildings would create a forecourt in front of it. In 1915, when the respective plots were sold, the architects ignored this and pulled back the facades of those buildings too, creating a uniform line. The developers on the other side of the street had also pulled the buildings back from the street, so that Bygdøy allé is much wider in this section than elsewhere. In 1916, a number of new congregations were created close to the city centre. Most of these do not seem to ever have had a church and were in the end dissolved, due to the dwindling populations in the central parts of the city. Wexel congregation was dissolved already in 1929, while Hauges and Matteus congregation were both dissolved in 1938. In the case of Markus, a church was built and consecrated in 1927. The architect behind Markus kirke was Sverre Knudsen, who choose a baroque style instead of the usual medieval. The style is apparently inspired by Swedish architecture, and has been described as nordic neo-baroque with elements of neo-classical. The facades are in plastered brick; stone dressing had going out of fashion ever since Tøyen Småkirke in 1907. The entrance portal is in granite though. Exposed brick had also made a comeback. Lovisenberg was built for Diakonissehuset in 1912 and Harald Aars also designed Vestre Frikirke in 1920. A plot was found on a property called Høiens Grunn, located in an area that was built up in the 1890s. The difficult topography had left a gap, but this also meant that the construction of the church would be slow and difficult (1923-27). Some of the bedrock is still there, and the church is accessed via a staircase from street level. The original borders of the new congregation were between Pilestredet, Dalsbergstien, Frydenlundgata, Ullevålsveien and Nordahl Bruns gate. A part of Gamle Aker has since been incorporated while a different part has been given to Trefoldighetskirken. Majorstuen Church was also built around this time, in 1926, but was only made a full congregational church in the 1960s.